My floral portraits were shot in the studio on a medium format film camera, the Fujifilm GX680 with a 125mm lens. My only illumination was the Hosemaster lighting system, a remarkable invention by American photographer, Aaron Jones. The inspiration for this image came from two sources: the Frangipani (Plumeria) tree that dropped its delicate flowers on the path to my studio; and the work of Australian photographer, Olive Cotton (1911-2003). 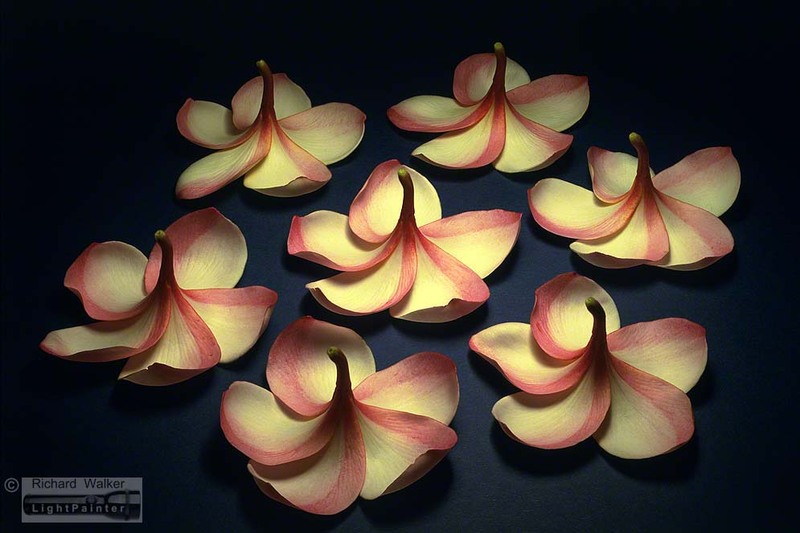 In 1935 Cotton shot “Teacup Ballet”, an arrangement of cups and saucers dramatically backlit. It became one of her best-known works. My image is very different but a number of clients have asked if I knew of Cotton’s iconic photograph. Shot on 120 Velvia film in 2000. What a difference a change of angle makes! This is an example of serendipity. It had been a late night in the studio in 2000. 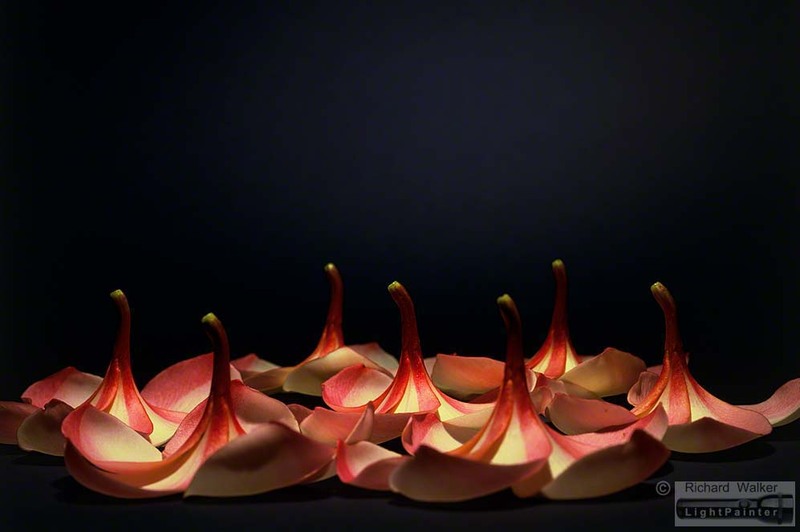 I had just shot the previous image, Frangipani Ballet, and was packing up. The camera had been perched high on the tripod’s central column and as I lowered it to the level of the flowers, I saw this new composition appear in the viewfinder. It was as if I was in the front stalls watching a performance by the Australian Ballet. I fired up the Hosemaster and used the same simple lighting arrangement to photograph this view. Some shots come to you in a flash. Early one morning in 2001, I was walking through the Sydney Flower Market, searching for perfect blooms. 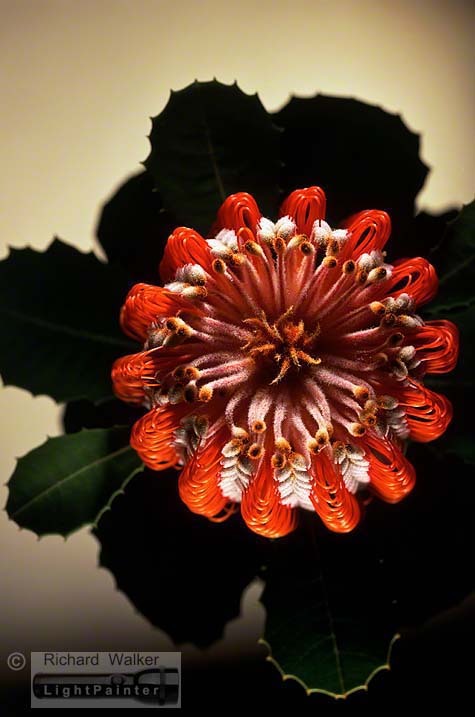 Suddenly I caught sight of this magnificent Bankia (Banksia Coccinea) in the bottom of a seller’s bucket. I was looking down on the flower (just as you see it now). 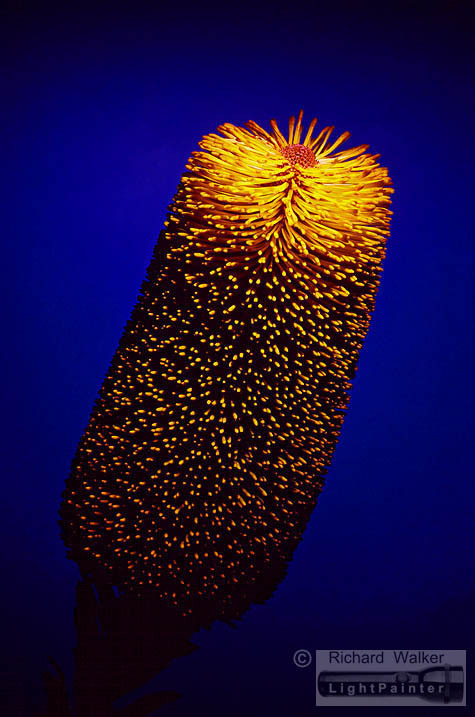 It was like a revelation — as if I was seeing the Banksia for the first time. Its form was so symmetrical, yet so enigmatic that I had to buy it and photograph it. Some years later, this image was purchased by the InterContinental Hotel in Sydney. When I recently visited the hotel’s website and searched their photo gallery, I found my Banksia print hangs on the wall of their State Suite. That’s probably as close as I’ll ever get to this luxurious accommodation. Composing images in the studio is fantastic fun. I joke with clients that my floral portraits are a two-way affair. The flowers and I discuss how they want to be photographed and I promise to shoot their best side! It certainly helps the process if I have some theme in mind, or an aspect of the flower appeals to me. In this case, I wanted to suggest a relationship between these two blooms — as if they were child and parent, or student and mentor. Shot on 120 Velvia film in 2001. In the studio, the Hosemaster lighting system allows me total flexibility. As the light source is hand-held, I can position the beam at any distance or angle. 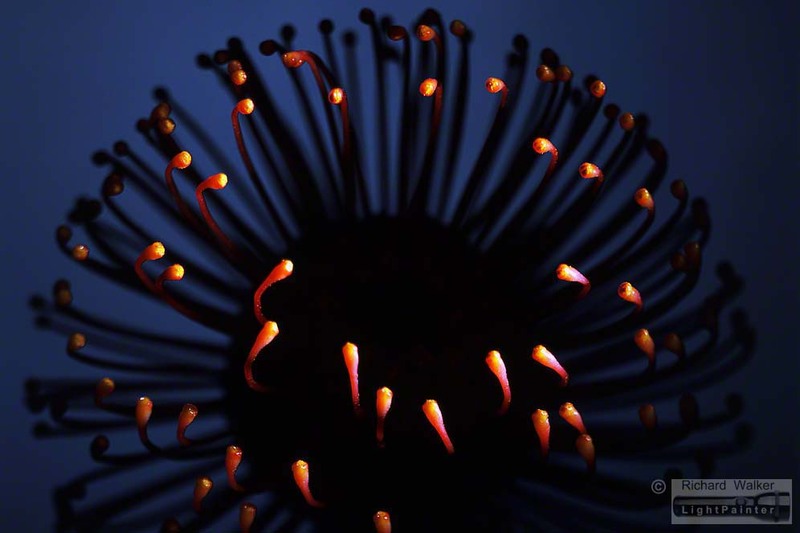 This was the second image I produced of this South African flower (Leucospermum Cordifolium), commonly known as Pincushion. 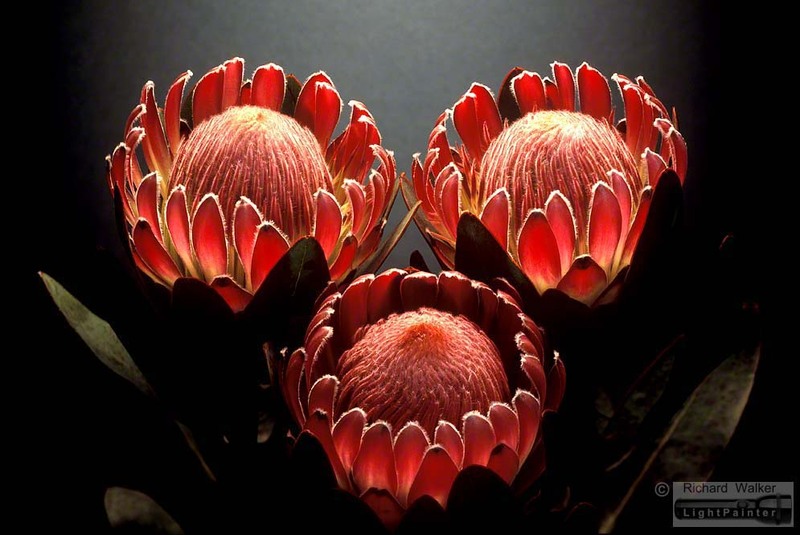 In the first image, the red centre of the flower was lit and the curved “styles” in the foreground were silhouetted. Then I raised the light beam just a fraction so it only skimmed the tips of the styles. This small shift produced an image that was much more dramatic and intriguing. It can be rewarding to explore an idea. I love the deep shadow and crisp highlights produced by light painting! The Hosemaster is very versatile. 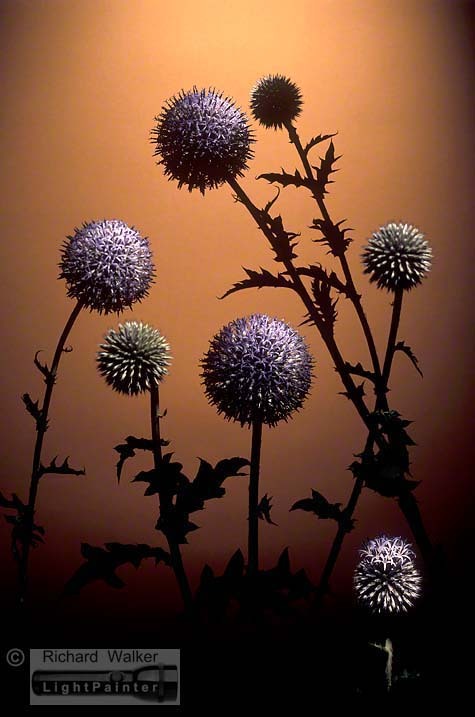 It can flood a background with light or it can produce a tiny spotlight that then enables me to highlight small areas in a scene — like the spiny heads of these Globe Thistles (Echinops). Shot on 120 Velvia film in 2005. This big bright look is unusual for me. I wanted strong colour contrast and a clean background. Composing a group of these Australian native flowers was tricky. 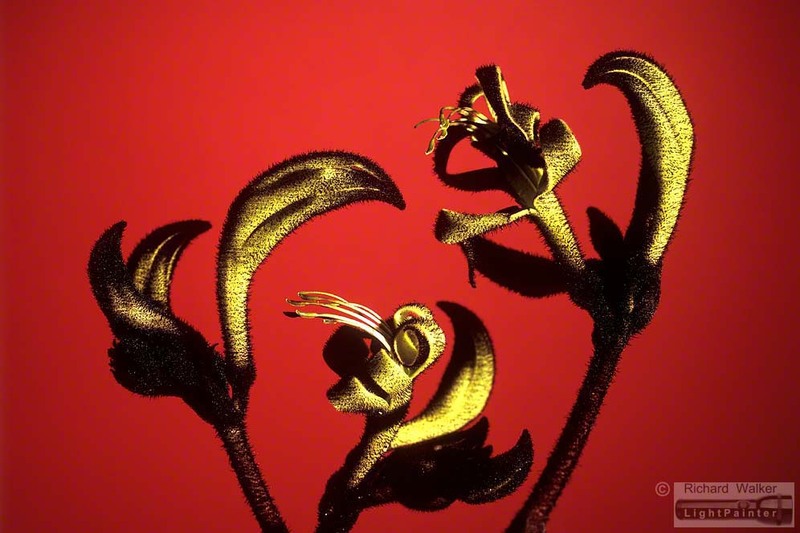 I chose three Black Kangaroo Paws (Macropidia fulginosa) in different stages of flowering and spent a long time in the studio trying to arrange an effective composition. These flowers were quite small so depth of field was a challenge. Shot on 120 Velvia film in 2005. 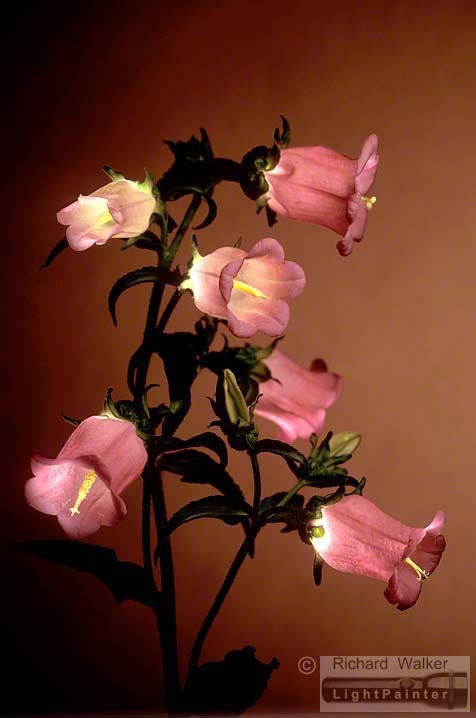 When I first saw these bell flowers (Campanula medium) I was struck by their delicate beauty. 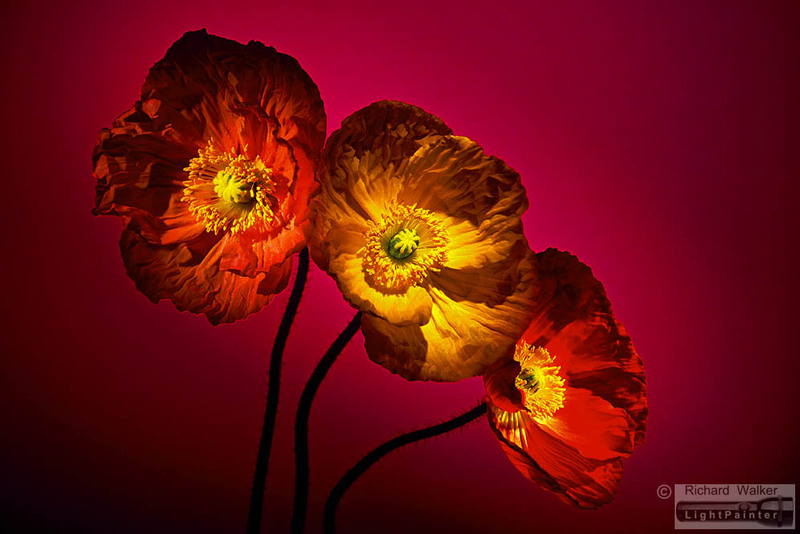 As I composed the flowers stems in front of the lens, I began to see a similarity with Art Nouveau flower lamps. I wondered if I could use the Hosemaster to light the interior of the flower bells to create the impression that light came from within each flower. I aimed a narrow beam of light into each bloom, being careful to avoid overexposing the central yellow stem. The other challenge was to find the best balance between the glow of each bloom and the floodlit background. This is one of my most popular prints. I’m not sure why it appeals to people, but for me I love the delicate “crushed paper” texture of their petals. And they always have this sunny disposition. Whenever I see them, they liven up my day! In floral portraiture I like to follow the European tradition of using an odd number of flowers. It’s not a strict rule for me, but if I have a choice I will always opt for photographing 1, 3, 5, or 7 blooms. This image is about “less is more”. I decided to photograph just one flower spike with no leaves or any other dressing. I wanted to concentrate the eye on the texture of this particular specimen (Banksia praemorsa). I held a tiny spotlight over the top of the flower spike and then edged it forward until the light just skimmed the heads of the tiny flowers. I love the way the flower spike glows — like some modern fibre-optic creation that is 40 million years old! Shot on 120 Velvia film in 2003. I hand-picked these beauties at the Sydney Flower Market. I had pre-visualised this composition and was looking for three blooms — with two slightly more open than the third. 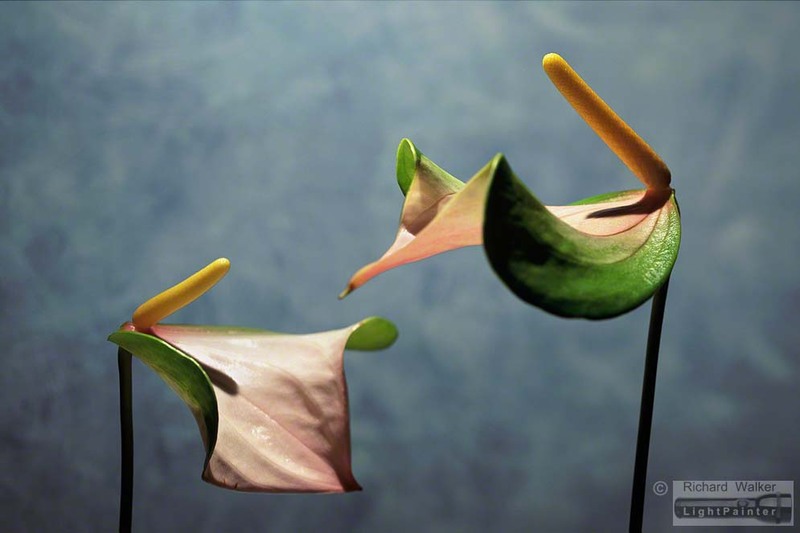 In the studio, I used the Hosemaster to carefully spotlight each flower head so that very little light spilled onto the adjacent leaves. I wanted to accentuate the shape and texture of these stunning Australian flowers. I have great admiration for flower photographers who work in the field but for me, I don’t enjoy battling wind gusts, congested flower beds, fading sunlight or distracting backgrounds. The main reason I shoot in the studio is because I want total control — of my subjects, lighting and backgrounds. My passion has always been to produce distinctive portraits of beautiful flowers. 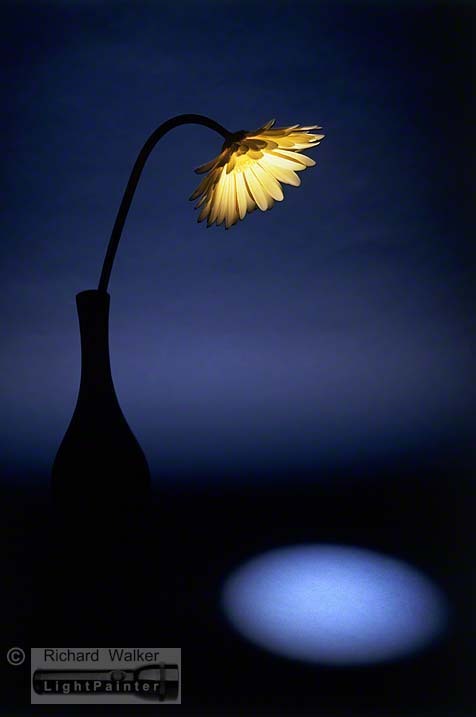 And sometimes my portraits allude to something else, such as the streetlight effect with this gerbera. This image was not composed in Photoshop. There are four separate exposures on this single frame of film — the background, the foreground pool of light and two different lighting effects on the flower head. Shot on 120 Velvia film in 2000. Ian, thanks for taking the time to view my work. Great pictures but many really funny. Almost anthropomorphic. I see ballet dancers, synchronised swimmers. water birds, a ghost, marine mines, Chinese fingernails, a Victorian standard lamp, the Andrew Sisters, a bottle brush (of course), insect traps and an hilarious bedside table lamp. That’s quite a lot for my money. John, I’m very flattered that you thought so much about my images. Thank you for your time.